As customers begin to utilize multiple channels to make purchases, it has become vital to stay connected everywhere they are. Not just the increased popularity in local searches, but the priority Google has placed on local search makes it easier for local businesses to reach more of their community. That’s where local SEO enters as a cost-effective method to increase your business reach and engage with more potential customers. In fact, 88 percent of people who search for local businesses on their mobile phone end up calling or visiting the business within a day of that action. Mobile searches for “open,” “now,” or “near me” have grown by 200 percent, indicating that local SEO often acts as the bridge between online and in-store transactions. Think about the additional traffic your business would get from that! 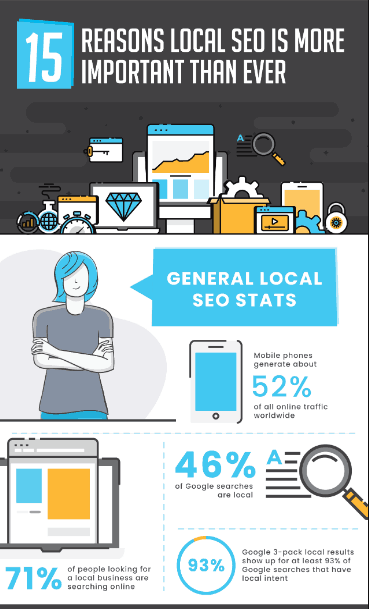 BCC Interactive has put together an engaging infographic, showing the many reasons why local SEO is more important than ever.